On the 3rd of January 1521 Pope Leo X issued his Papal Bull of Excommunication Decet Romanum Pontificem against Martin Luther. 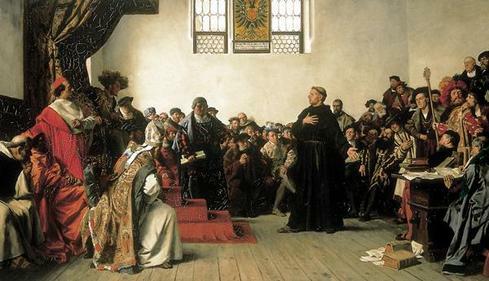 The excommunication followed Luther’s publication of his three masterful works published in 1520 To the Christian Nobility of the German Nation, On the Babylonian Captivity of the Church and On the Freedom of a Christian. The excommunication was the second act of a three part drama. The first part began with Luther’s publication of the 95 Theses on October 31st 1517. That launched a series of actions by the Papacy in which various representatives were sent to bring Luther back into line. Failing this the last of the inquisitors, Johann Eck became Luther’s and other Reformer’s constant nemesis for the next 25 years. 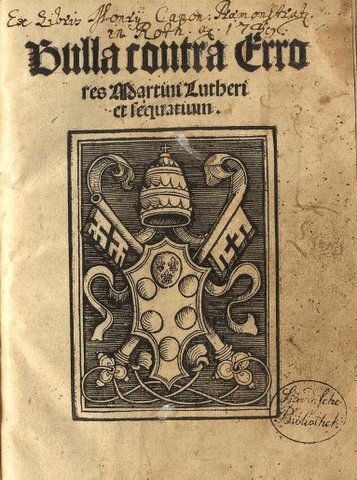 In the summer of 1520 Eck brought back to Germany Leo X’s Papal Bull Exsurge Domine which attacked and condemned Luther’s writings, a prequel to the formal excommunication. Eck was not well received and Luther’s movement began to gain more traction especially among much of the nobility and among other theologians. “Nevertheless Martin himself—and it gives us grievous sorrow and perplexity to say this—the slave of a depraved mind, has scorned to revoke his errors within the prescribed interval and to send us word of such revocation, or to come to us himself; nay, like a stone of stumbling, he has feared not to write and preach worse things than before against us and this Holy See and the Catholic faith, and to lead others on to do the same. He has now been declared a heretic; and so also others, whatever their authority and rank, who have cared nought of their own salvation but publicly and in all men’s eyes become followers of Martin’s pernicious and heretical sect, and given him openly and publicly their help, counsel and favour, encouraging him in their midst in his disobedience and obstinacy, or hindering the publication of our said missive: such men have incurred the punishments set out in that missive, and are to be treated rightfully as heretics and avoided by all faithful Christians, as the Apostle says (Titus iii. 10-11). III. Our purpose is that such men should rightfully be ranked with Martin and other accursed heretics and excommunicates, and that even as they have ranged themselves with the obstinacy in sinning of the said Martin, they shall likewise share his punishments and his name, by bearing with them everywhere the title “Lutheran” and the punishments it incurs. Our previous instructions were so clear and so effectively publicised and we shall adhere so strictly to our present decrees and declarations, that they will lack no proof, warning or citation. Our decrees which follow are passed against Martin and others who follow him in the obstinacy of his depraved and damnable purpose, as also against those who defend and protect him with a military bodyguard, and do not fear to support him with their own resources or in any other way, and have and do presume to offer and afford help, counsel and favour toward him. All their names, surnames and rank—however lofty and dazzling their dignity may be—we wish to be taken as included in these decrees with the same effect as if they were individually listed and could be so listed in their publication, which must be furthered with an energy to match their contents. After his excommunication Luther appealed to Emperor Charles V who initially rejected it outright but reconsidered in light of the danger that the Empire faced if German states revolted. Charles invited Luther to the Diet promising him safe passage. The fact that Luther was able to appear at the council safely was in large part because of Elector Friedrich the Wise, his protector insisting that Luther not be imprisoned or outlawed without a hearing. Along the way Luther was greeted as a hero by townspeople, it was something like a victory parade. 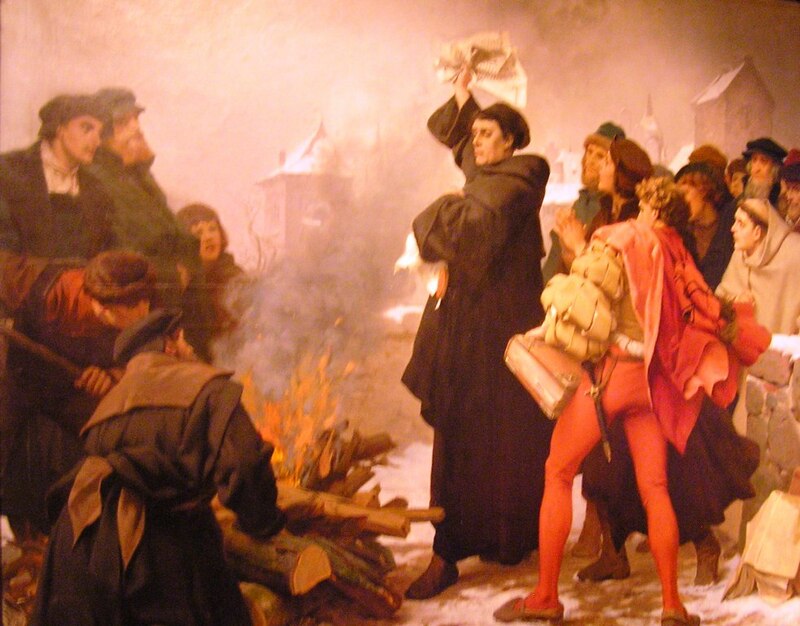 When the hearings began the Archbishop of Trier asked Luther if he would recant his writings. Luther asked for time to consider and at 4 PM the following day was called back to the Diet, where before the Emperor and the Princes of Germany he stood alone. Friedrich the Wise spirited Luther away in a staged “kidnapping” to the Wartburg Castle, allowing him to evade those that sought his life and to stabilize the Reformation in Germany. I have always felt a closeness to Luther. He is one of my heroes. I recognize that he was neither perfect, nor do I agree with everything that he wrote or some of the things that he did. That being said, this very imperfect and often impetuous Monk, Priest and Professor is close to me. His “Theology of the Cross” makes more sense than others I have read, and his defense of the Eucharist was instrumental in my faith journey. 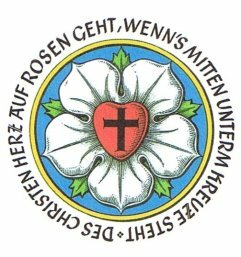 Luther, despite many in the Catholic Church who fight for him has not been “rehabilitated” nor the bans of excommunication removed. He has been called by some a “reluctant revolutionary.” I hope that Pope Francis will lift the excommunication despite the Roman tradition of not lifting such bans on those who have passed away. In seminary Luther, his writings and theology were instrumental in coming to a catholic understanding of the the Christian faith. Now that understanding was much more interpreted in light of the Second Vatican Council and more progressive theologians such as Hans Kung, Bernard Haring and Yves Congar, but it was still catholic and a clean break from my Evangelical Protestant background and education. Likewise, when I was ordained as a Priest in a more conservative Anglo-Catholic denomination in the mid 1990s I never dreamed that I would face a time where my writings would mark me as a “heretic” in the eyes of some in that church. Nor did I think that I would be told that I was “too liberal” and needed to leave that church. Before that I had been censured and forbidden from writing because I was “too Catholic” by another bishop. Like Luther I assumed that what I wrote and said were readily apparent. Since I have written extensively about that situation and don’t feel the need to go into detail here. 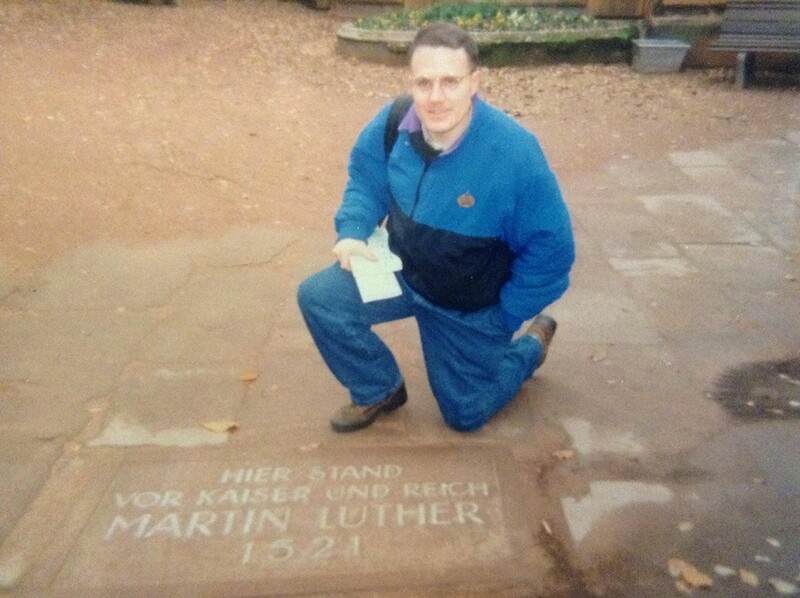 In 1996 I led a series of tours of Luther’s reformation sites in Germany, including Wittenberg, Heidelberg and Worms. I posed for pictures outside the door of the Castle Church as well as at the site where Luther gave his “Here I stand” speech. I was so familiar with the locations in Wittenberg that I was asked if I had ever been to them before. I could only say that I had never been there in person, but had been there many times in my mind. When at each location I felt a tremendous closeness to a man who had influenced so much of my spiritual journey. I think that “Christian” television, radio and entertainment is perhaps the among the most destructive forces in our society. In them a complete insulated subculture of demigods living in their own self made cloud-coo-coo land of make believe attempt to give answers for society’s ills, protect the faithful from the evil of non-Christian thought and for that matter of non-Christian people and to influence politics in ways that Jesus would never countenance. I know this. 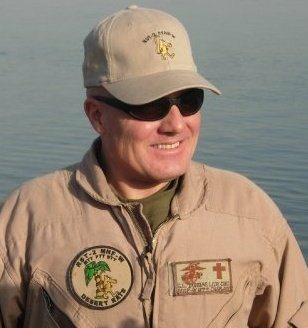 I actually worked for a ministry of one of the current leading “Pastors” of the Christian political right back in the 1990s. The mindset inside the television and radio ministries of Evangelical Christianity is almost as insular, make believe, paranoid and power hungry as was the Papal Curia in 1517. Actually for someone who is a historian with a pretty in depth knowledge of the Reformation, particularly that of Martin Luther in Germany it is a frightening thing to see. It seems today that preachers, in particular those in high profile mega-churches and ministries want to say something about everything under the sun and then throw in a “In Jesus Name” here and there to make their opinion sound Christian. Now that is not a problem limited to big name evangelists or even Evangelical Christianity. It exists in mainline churches, the Catholic Church and even other religions, can I get a Fatwah on that? But because the leaders of the multi-billion corporate empires of the modern Evangelical movement have a vested interest in keeping the money flowing into their tax exempt institutions they must be relevant. Thus even if they no nothing about a subject they must write books and preach sermons on what God thinks of well you name the topic, everything from economics to foreign policy and even who God says you should vote for or against certainly not for the black guy in the White House, but I digress. Bonhoeffer saw preachers of his era do the same thing and he was a critic of them with good reason. In their fear and hatred of the change that occurred when Imperial Germany went under and “Jews and Bolsheviks” threatened their position they ended up helping to create a climate where Hitler not only came to power but had the open support of many Christians and the tacit approval of the vast majority of German Christians of all denominations. In the midst of crisis and uncertainty they gin up fear against “the non-Christian other.” The big problem for the German Christians of the 1920s and 1930s as well as our current crop of American church leaders is that they stopped listening and instead decided that they had the answers to all of society’s problems. In Germany after the Nazis were crushed by the Allies the Churches suffered major losses of credibility. Young people who had experienced the war, or who grew up in the desolation of post-war Europe left the churches in droves because of the terrible witness of supposedly Christian leaders and churches. I would dare say that the vast majority of Evangelical leaders have simply stopped listening to anyone that would disagree with them. The evidence is manifold in our current political crisis in the United States where Christian leaders often are the most base and vile of all political pundits and politicians. It is no wonder that the fastest growing religious preference in the country is called “the Nones.” In other words those with no-religious preference who have dissociated themselves from any Christian church. It is not because they have a problem with God or Jesus per say, it is because of the pompous asses that only care about them for the market share. Chuck Colson once noted that the Pastor of a large mega-Church told him that he was “paid to keep them coming in the door” not to preach any real truth, but to keep the empire afloat. Believe me the mega-churches and media empires of Evangelicalism require vast amounts of money just to keep their mortgages, air time and pastors well paid. Moral lapses and corruption in these empires is rampant. Time after time the leaders of these “ministries” are exposed as money grubbing hypocrites who lash out at whatever group that they need in order to create straw men to keep their ministries alive. Basically the leaders of Evangelicalism have stopped listening and even worse stopped caring about people. The empires must be maintained by “tithing units” as the son of a Bishop once called parishioners. It is the ultimate devaluing of people that Jesus died to save. Think about it. People only matter for the capital that they contribute to maintain the institution. I cannot think of anything more blasphemous and it will be the cause of the fall of contemporary American Evangelical Christianity.